This came across my Facebook page today. And somehow, it seemed perfect for the last day of March, the last day of slicing for this year. Actually not really the last day of slicing, because we will slice again on Tuesday. But this day, the last day of March, even the seventh time, feels, like always, a little bittersweet. I think about all of the stories I have read this month- slicers like Linda, Elsie, Michelle, Tara, Ramona, Chris, and Elisabeth and others- people I have followed for years. They've become more than fellow slicers. They have become friends. I think about all of the new slicers- my Welcome Wagon folks- that I got to know for the first time this year.I have loved getting to know them through their stories. I hope I will see them on Tuesdays. I think about the people that didn't slice this year- Cathy who started, then went on vacation and didn't pick back up again, and Nancy- who I have followed for years. I hope they will be back next year. I missed their stories. I think about the stories I have told this year. Stories of possible retirement. Stories of struggling sons. Stories of school. I know next year I will look back on these stories, from farther down the road. I wonder how I will view these stories then. And I think about the stories yet to be told. So many stories are left. My teaching friend, Kathy, and I have a running joke. We call ourselves the Wonder Women. No, not Wonder Woman like you traditionally think of. and blue and white starred swimsuit bottoms. wondering where we put things. I wonder where I put my keys. Kathy wonders where she put the piece of paper with last unit's math scores. I wonder where I put the reading data I just printed out. Kathy wonders where she put a gift card someone gave her. We wonder on and on and on. I had lunch with a friend, then dashed across town to renew my license plates. so I stuck it on license plate the minute I walked out of the Department of Motor Vehicles. One more thing off of my spring break list. And remembered that my son's license plates were also due in March. The thing is, I would swear I already renewed his plates. I thought I did it online. I thought the envelope came in the mail. and told him to put it on. He swears it didn't happen. That I never gave him an envelope. where I found my renewal notice. And of course it has to be done by tomorrow. OK, I'm going to admit it right up front. is a language I don't speak. I'm not one of those people who spends lots and lots of money. I don't have a fancy house or fancy clothes or a fancy car. or spend a lot of money on exotic vacations. But I'm also not one of those people who is super careful with money. If a student asks me for a book, I order it. If I need snacks for a meeting, I buy them. If I'm teaching a class and I need markers or copies, I head over to Office Max. My money habits have never been a problem. Until now I think maybe they are. Because now I'm thinking about retirement. And all of a sudden I'm thinking I should be worried a little more. I'm not sure I should be. It all started this afternoon. I went to a retirement meeting. Not because I am sure I am going to retire. But because I might sometime soon. A whole lot better than I do. I had coffee with a friend before the meeting. She is much, much younger, than I am. As in her parents are just a few years older than I am. As in she is expecting her first baby in June. "I'm not good at money," I confessed to her. And she told me she wasn't good at money either. that it was ok because her husband is really good at money. Which might be ok. Except I don't have a husband. So I went to this meeting. when I walked in the door. I really don't want to retire. Love, love, love the kids. And it kind of feels like I'm not sure I will have a choice. I really wanted to just run right back out the door. But I forced myself to sit there. when I am listening in Spanish. if I really, really concentrate. or run right out of the room. is a language I just don't speak. And really struggling right now. He gets up about ten. Waits for his brother to get home. Indulges in his favorite Colorado habit. He's had I don't know how many different jobs. And usually lasts about a week. He's tried two different junior colleges. He says he is going to the military. But they haven't called him back. Or responded to his emails. I've tried talking to him. I teach at a school that is approximately 95% Hispanic. Some of our kids were born in the United States. Some of our kids were born in other countries- mostly Mexico, but also El Salvador, Guatemala, Costa Rica, Puerto Rico, and others. Some are legal immigrants. Some are not. The kids at my school have been a mess since November. They are terrified. Many have family members that have gone back to Mexico, or that are living in fear of being deported. Kids regularly tell me that they are afraid they will go home from school, and that their families will be gone. This is where the power of books becomes real to me. I read, a lot, because I love words and because I love stories. However, I also read because reading reminds me that I am not alone. Reading exposes me to people that are brave and stand up for others and do the right thing. Reading helps me to be the person that I want to be. I work really hard to expose kids to books that teach them those important life lessons. I read aloud lots of biographies, historical fiction, and narrative nonfiction. I came across one of those books last week and shared it with my intermediate graders and middle schoolers at my school. STAND UP AND SING: PETE SEEGER, FOLK MUSIC, AND THE PATH TO JUSTICE is a terrific new picture book biography by Susanna Reich. Reich follows Seeger from the beginning of his life to the end- his adolescent interest in Native Americans, how he learned to play the banjo, the difficulties of the Great Depression, playing his banjo at union meetings and strikes, meeting Woody Guthrie, getting married, being blacklisted, working with Martin Luther King, Jr., protesting the Vietnam War, and finally, building the Clearwater. I loved this book, mostly because of the life lessons kids can learn from Pete Seeger. • Pete Seeger teaches kids to use the talents they have been given. "That night Pete saw that music could fill a room with peace and harmony- even if he still couldn't figure out how to sing and play banjo at the same time"
• Pete Seeger teaches kids about taking care of others. "He read about Native Americans and loved the idea that in some tribes, everything was shared. 'I decided that was the way to live: no rich, no poor. If there was food, everyone ate; if there was no food, everyone went hungry.'" • Pete Seeger teaches kids that sometimes it's hard to stand up for what you believe. "On tour, the Almanacs slept on people's couches or in cheap hotels, including one with enormous cockroaches in every room. The following winter in New York City, they couldn't afford heat in their apartment. Pete didn't mind the cold. It felt good to be making a difference in the world." • Pete Seeger teaches kids to have integrity. In 1955, Pete was called before the House Un-American Activities Committee. He refused to take the Fifth Amendment, but also refused to share names or rat on his friends and colleagues. These choices came at great personal cost- for over a decade Seeger was blacklisted and was not allowed to appear on commercial shows. • Pete Seeger teaches kids to be brave. At one point in his life, Pete and the African American singer, Paul Robeson, were in an concert near Peekskill, New York. Some people were angry that whites and blacks were performing together. After the concert, they followed Pete and his family, and threw rocks at the car. Every window was shattered. "Later Pete found two rocks inside the car and cemented them into his fireplace. They always reminded him how important it was to stand up for his beliefs." 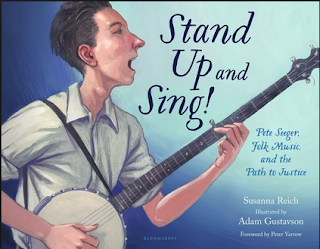 STAND UP AND SING: PETE SEEGER, FOLK MUSIC, AND THE PATH TO JUSTICE is illustrated by Adam Gustavson (if you are familiar with Reich's work, he also illustrated FAB FOUR FRIENDS, about the Beatles). Each two-page spread includes a large full color oil painting; many also have a pencil sketch. The book begins with a foreword by Peter Yarrow of Peter, Paul, and Mary. End notes include an author's note, as well as an extensive list of additional sources. In these very difficult times, it's important to be able to give kids models of people who had integrity, stood up for what they believed, and did something to make the world a better place. STAND UP AND SING: PETE SEEGER, FOLK MUSIC, AND THE PATH TO JUSTICE is definitely a resource you can use. I recommend it highly. Pete Seeger at Obama's inauguration. I haven't seen David since he moved out around the first of the year. (I wrote about him here, and you might remember it, if you have been reading my blog). And I've missed him. I've missed seeing him on his bike, with its rainbow lit pedals. I've missed coming home to find him working on surprise yard projects. I've missed his checking in to see if I'm okay, and his "I got you, baby." He finally rode by last night. Actually, he came to see his buddy, Kenny, who lives in his mother's garage, two houses north of me. I was walking my dog, and saw him out in the alley. "Not bad, for someone homeless," he said. "Homeless? I thought you had an apartment at Colorado and 17th." "I was staying with someone, and it didn't work out, she kicked me out. I've been homeless for about a month now. You got a room? I can pay rent. I can pay $500 or $600 a month." "I don't have a room, David. Both the boys are still there. I don't have an extra room. I wish I did." I'm actually not sure that would be a smart thing, given David's ongoing issues with alcohol, but he is a friend, and I hate knowing that he's homeless. "You know anyone who has a room? I can pay $500 or $600 a month." I try to think of someone who might have a room. I don't know anyone. "So where are you staying right now?" I think he must mean the Denver Rescue Mission. "You mean at the shelter?" "Yeah. You gotta be tough, baby. You gotta be tough. I'll get through this." "You will," I say. "You will." I know he lived with his mother for many years in the house on the corner. "Where's your mom?" "She's in assisted living out in Aurora." "And you can't stay with her?" There were a lot of other people who seemed to come and go from the house. I wonder where all of them have gone. "What about all of those other people?" "Nah," he says. "I don't want to go around them. None of them have places." He tries one more time. "What about your garage? We could clean out your garage and I could live there. I could pay you." This conversation is breaking my heart. "You don't want to live in my garage, David. There's no heat, and no bathroom. And it will get really hot in summer." "I got my name on some waiting lists," he says. "About six right now. I want to have my name on twenty lists. But they are anywhere from a few weeks to three years." "I'll keep thinking," I say, running once again through every connected I might have for someone who is homeless. By now, the dog is getting antsy. "I gotta go," I say. "I'll come by and see you," he says. "Maybe I can do some work in your yard." "Yeah," I say. "I need to do some serious yard work this week. Come by and help me." "I will," he says. "I'll come this week." "You can leave your mower and stuff in my yard if you want." I hate knowing my friend is homeless. I have been a teacher for 36 years. A long, long time. And I have loved it. Pretty much every minute. But now I am wondering whether it's time to go. Life at my school has changed dramatically. The principal who hired me retired a few weeks ago, very unexpectedly. The district has adopted a new model of teacher leadership. Each school is required to have teacher leaders who coach and evaluate. The job is somewhat similar to what I do, with one major exception. I don't evaluate teachers. Nor have I ever really wanted to. For me, the evaluation piece changes the trust I have worked hard to establish with teachers. I went back and forth on whether I would apply for the teacher leader position. I really love my school. I love my colleagues. I love the kids. I loved my principal. I decided that I would apply so I could stay there. I would just have to do the best I could to use the evaluation system in a way that honored teachers' hard work and growth. I applied. I interviewed. I wasn't chosen. And I'm wondering whether it's time to go. I think I'm probably too old, at 58, to be a viable candidate for other positions. So I'm wondering whether it's time to retire. I don't know what you do when you retire. I have talked to several people about it- one woman, who was a total stranger I met at a meeting, looked at me like I was crazy when I asked what she did every day. Another friend told me she is making plans by volunteering with several different organizations. I'm still not sure what that means for me. I have always loved teaching. And it's been a huge part of my life. 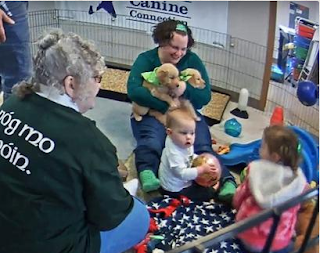 Before I adopted the boys, I spent a lot of time, pretty much every waking hour, on my job. Since the boys have been grown, I've pretty much resorted to that again. I work a lot. It doesn't feel like work, because I truly love it. But I don't have lot of outside interests right now. I don't volunteer anywhere, except for stuff that's school or work related, e.g. the state literacy association. I'm hate cooking or and I'm not good at gardening or art. I like to travel, but almost all of my friends are married or in serious relationships and they travel with their husbands. My sons don't want anything to do with me right now. I don't know what I would do if I retired. I have a paper that was due on Tuesday. I still haven't turned it in. I'm wondering if I will get any credit. I'm sad about that. But I have learned a lot about writing from this paper. 1) I haven't turned it in because the topic is huge. We had to choose a topic related to English Learners (EL's) and assessment, and read two articles about that topic, preferably with opposing points of view. Then we had to summarize and critique the articles, then connect them to the other articles we have read in the class. And do it in 2200 words. I have written and written and written for the last ten days, trying to include all of the different components. I thought I was almost done, until I did a word count. I had 3800 words. I'm down to 2700, but I haven't done a good job connecting to previous readings. I still need to work on that a little more, then probably cut another thousand words. That's a lot of words. 2) I haven't turned it in because I'm grappling with the topic. My topic is translanguaging. Do you know what that is? It has to do with the makeup of the bilingual brain. In the past, people used to think that the two languages were basically in two separate brains, that could be turned on or off, depending on the linguistic demands. Switching back and forth between the two languages in one conversation or one piece of writing was called code switching. Code switching was strictly frowned upon. Now, linguists believe that Emerging Bilinguals (EB's) move continuously back and forth between the two languages. Current research suggests that it's ok for students to use both languages, and that there are, in fact, circumstances where that can enhance the language of the L2. I read two articles, one about university students studying to be teachers in Costa Rica, who constantly use translanguaging in their own lives, but don't want kids to do it in their classrooms. The other article is by two professors from CU. Their research looked at the Colorado Basic Literacy Act, now called the READ Act. Kids were placed on reading contracts based on the assessment of one of their two languages. The researchers think that this results in many misdiagnoses of primary grade readers. The topic is really interesting. My understandings are still developing. I need to talk about them. I want to talk about them. But the professor doesn't want exploratory thinking. He wants polished finished thinking and I'm not there yet. 3) I haven't turned it in because I can't get the hang of the voice. It's a research paper. Written in third person. I hardly ever write in that voice. I don't like it. And I'm having trouble doing it well. And I end up with way too many words. And sometimes it feels like it doesn't make sense. 4) I haven't turned it in because the professor is super nit picky about APA style. The last paper we wrote, I was really proud of. We had to analyze an assessment. I did mine about a new reading assessment my state is doing. It was ten pages and I worked really hard on it. I thought I had done a great job and was really proud of my work. He wrote one comment on it, and marked about a million places where I had forgotten a period or somehow incorrectly used the APA style. Now I'm super neurotic about making mistakes with the APA style. 5) I haven't turned it in because I don't think the professor likes my writing or thinking. And it's giving me writer's block. And I'm really tired. And it's hard to write well when you are tired. As I have been struggling this week, I have been thinking about our kids, who have been taking PARCC for the last two weeks. We expected them to read difficult texts and write in a really academic voice. And get the thing typed. And not make mistakes. In a relatively short time. And then it's months and months before they hear how they did. And there is no specific feedback. Given those conditions, and the high possibility of failure, I'm not sure I'd be willing to try all that hard. Sometimes I think I cannot stand one more day. The stories are so hard. I spot her first thing this morning. Today her head is on her desk. Face buried in her arms. She does not lift her head. she is upset about her birthday. It is during spring break. She thinks no one will celebrate. No one will acknowledge her special day. Everyone should have a birthday. Teachers. Administrators. Office staff scramble. A quick run to the grocery store. "But what should I say? that she is a precious treasure. Sometimes the stories are so hard. We meet after school. The state adopted a new computerized reading assessment this year. We are required to give the assessment once a month. Students are classified as Tier One, Tier Two, or Tier Three. We are still learning to interpret the results, to know how to use the data to drive instruction. Earlier today, I retested one of the kindergarten boys. He had tested as a Tier Three this month. His teacher wasn't sure that was accurate. We are allowed to retest if we want to. I'm a reading interventionist, and I've been trying to pull those types of kids every time I have a free minute or two. F was delighted to come to the library to read with me. I watched as he took the test. Made notes about what he could and couldn't do. Marveled at his kindergarten brain. And now we are meeting to discuss the data. C's partner comes over from next door. It's not a scheduled meeting. She doesn't have to come. But she does. Because she cares about kids. Because we want to understand this assessment. So we can do a better job with our kids. We look at the numbers. I tell them a few stories about the things I noticed as F worked through the test. How he made personal connections to the stories, but then got so excited about those that he forgot to listen to the rest of the question he was supposed to answer. How he burst out into the "ch" digraph song, when a test item about digraphs came up. How he knew beginning sounds and rhyming words, but had trouble when the test alternated with these two types of questions. And he how he had tested not as a Tier Three reader, but rather as a Tier One reader, when he worked one-one with me. We wondered which results were accurate. Wondered whether the littlest guys would do better with iPads. Wondered how much of what the test measured was developmental. How much was about kids' familiarity with technology. We talked about how we might be able to test all of our Tier Three readers one on one to see whether they might do better in a one-one situation. We thought about which kids were not being represented accurately by their March scores. Listed the ones we wanted to retest. Talked about what we thought we could do to solidify F's understandings of beginning sounds and rhyming. And pretty soon, a five-minute, "Let me tell you what F did this afternoon, when I worked with him" had turned into a 30 minute conversation. A time when real decisions about real instruction were made. A data meeting, at its finest. So I wrote a paper. And even though I worked really, really hard. It was only about 3/4 of the way done. And did what I thought was a really great job. The professor wrote one comment. And corrected about ten APA style mistakes. I wasn't really happy with this paper. The topic felt big and unmanageable. I still can't get my head around it. I'm not at all sure I did what the professor wanted. Iehearsed a couple of transition lines . what the paper is really about. But it's taken about 15 hours so far. I have a huge paper (a 2000 word research review) due tomorrow at 5:30 p.m. And I haven't started it. And I don't even really totally understand what the paper is about, or why I'm writing it. So I'm doing a quick currently slice, then trying to wake myself up, after a really long day, to get something on paper for tomorrow. WATCHING CSI. I like background noise when I'm working at night, but I hate shows like THE VOICE AND DANCING WITH THE STARS. And I don't like a show that takes too much attention or thinking. CSI is my drug of choice. LISTENING to nothing. I need to go to the library to get a new audiobook. WONDERING how my son's first night on his new job is going. Where my other son might have gone off to in his car. What I could write my paper about. EATING Nothing! I'm doing Weight Watchers and I'm out of points for the day! But I could still have some fruit. and I might, because my stomach is growling. DRINKING This morning's coffee, rewarmed in the microwave, with a little skim milk, but thinking I need to go get a glass of water, because I haven't had nearly enough today (see above). HOPING I don't have strep throat, which has been going around our school. I have been feeling kind of crummy since yesterday and now I'm starting to get a sore throat. Do you ever feel like "Big Brother is watching you?" I have that experience pretty regularly. Especially when I participate in Facebook. I first noticed it last year. The primary grade students at our school usually do an extended author study every spring. As part of the unit, they make T-shirts from their favorite book, then wear them to field day. The kids love them, and the teachers have an easier time keeping track of their kids. Last year, I helped the first grade teachers order their t-shirts. They were nothing fancy, just plain white t-shirts, as cheap as we could get them. The next day, and every day after that for about two weeks, my Facebook page was inundated with ads for little boys' underwear. It took me a day or so to figure out why I was getting the ads. My boys are not little. They don't wear Size 6 Fruit of the Looms. And then I happened to mention it to one of the first grade teachers and she explained that it was because I purchased the t-shirts for the author study. Facebook was watching me. It just felt icky. But I've noticed the phenomena pretty regularly ever since. With me, it's mostly about books, because that's mostly what I buy. And it doesn't just have to do with what I post publicly. Recently, a friend messaged me about buying a bathing suit for an upcoming trip. She was was talking about how expensive bathing suits are. And about how buying a bathing suit made her feel extra large. I concurred. And mentioned the name of a company that supposedly has attractive, not super expensive bathing suits. And ever since then, I have been receiving bathing suit ads. From that company. And from others. And especially for plus sized women. And with bargain prices. A little creepy. The "Big Brother is Watching You" phenomena took an interesting twist this week. 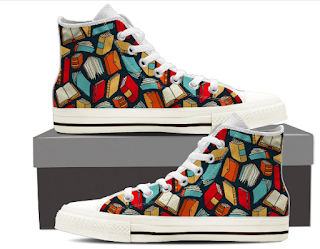 About a week ago, I saw an ad for a pair of high top tennis shoes with books on them. I loved them. I clicked on the ad, and saw that they were pretty expensive. But they were really fun. I didn't buy them then. But they kept coming up. And every time I would look at them, I wanted them. Sort of unusual for me, because I'm really not a shopper, or a clothes horse. And they were kind of expensive. And today they came up again. And it was a hard day. I didn't lose any weight on my weekly weigh in. In fact, I gained a pound. I came home and cleaned up the kitchen and ran the dishwasher. And then my son cleaned his room and left a huge pile of dishes on the kitchen counter. And we had a fight. And then I graded papers. That were supposed to be finished ten days ago. And they still aren't done. And I have a ten page paper due myself on Tuesday. And I haven't started it. So the shoes came up again today. And I clicked on them. And bought them. Because sometimes maybe the universe, or at least Big Brother knows what you need. when I can't hear one more story about what is going on in Washington D.C. I sneak away to go puppy watching. I don't sneak away physically. I sneak away to an entirely different virtual reality. (If you want to watch, go here. for warriors with PTSD and traumatic brain injuries. I've written about these guys before. and the Aurora theater shooting had just happened. 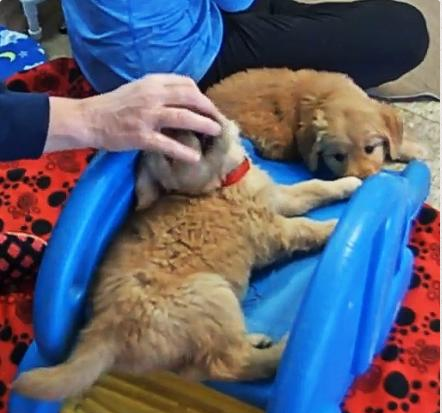 The puppies are about five weeks old. how to be service dogs. and it seems like only about half actually make it. I love watching them grow. A) Can I borrow some money? B) I don't have lunch money and I haven't eaten today. C) It's close to pay day and my parents don't have money, even 40 cents for reduced lunch, to give me. a) I have suffered a season-ending concussion and will be visiting the emergency room tonight, at which point I will tell my parent or guardian that I told the teacher on cafeteria duty I was hurt and she didn't do anything. b) I hurt myself twenty minutes ago, when we first went outside. Now that it's time to go back to class, I think I should get it checked. c) I left my (hot cheetos/gatorade/burrito) in my locker, and I really need to get out of the lunchroom and up the stairs to get it. "Miss, can you go outside with me?" a) My coat/hat/mother's diamond necklace that I borrowed but she doesn't know about is in the farthest reaches of the playground, approximately three city blocks from the lunchroom. I need an adult to go outside and get it with me. b) I need boyfriend/girlfriend/family advice and don't want my friends to know I'm asking. c) Oh wait, I actually left it in my locker, but I forgot because my executive function lobes are not fully developed. Miss, look what I can do! a) I spent three hours last night acquiring a new and wonderful skill- a Rubik's cute, flipping a water bottle, or wrapping one's leg around neighbor's neck- and now feel the need to share it. b) I'm feeling totally invisible today. Please let me know that someone cares that I am alive. c) I have some peculiar body-altering ability. As soon as I show you that I can do it, the other seven people at my table will also have to do it. And someone will probably fall off the bench and sustain minor injuries. Miss, did you ever have a boyfriend? a) Do you have a life outside of school? b) All of the other teachers are married. I don't think you are, because you aren't a Mrs. I wonder why you aren't. c) Do you think I will ever have a boyfriend/girlfriend/mate? Miss, how old are you? 1) You are the most ancient person in this school. I want to know if you are older than my grandmother. 2) Do you remember when they had those, what are they called, oh yeah, typewriters, did you have those? 3) Your hair is gray, so you are definitely old. I'm wondering why you don't dye your hair. c) have previously been somewhere weird, like someone's coat pocket or the floor by the furnace room. If an adult is stupid enough to put it in his/her mouth, everyone will spontaneously roll on the floor in hysterical laughter. This concludes the final section of the LUNCH DUTY PARCC. Please check your answers, then sign out. I am running down the hall, trying to drop off a stack of essays before I head out for the day, when I run into them. Three kindergarteners- two boys and a girl, wandering down the second floor hallway. The second floor is mostly older kids, but art, music, and computers are also housed on this floor. "Dr. Carol, we have a problem," says D.
"You do? Can I help?" "Yes. There are no paper towels in the boys' bathroom." "Oh, I can help with that" I say walking across the hall to grab some paper towels from the art teacher's sink. I pass out a handful of paper towels. I promise I will tell Mr. Tyler, our facility manager, and prepare to move on. The boys head back to music. D heads the other direction. "Where are you going?" I say. "I have to go meet F," she says. "She went to go tell the office about the paper towels." This problem is getting a little more complicated. The office is the opposite direction of where D is heading. "Sweetie," I say, pointing to the stairs, "She'll come up right here. The office is right below us. Why don't you just wait here, then when she comes, you can meet her." She is not convinced. "But I have to meet her where I left her." "But, D, if she went down to the office, she's not going to be where you left her. She'll come up these stairs." Somehow this conversation is not going well. And I have somehow acquired an audience. The sixth grade teacher has dropped her students off at specials and is standing in her doorway, fascinated with our conversation. Every time D says something, J makes a face at me. I decide to try another tactic. "D, sweetie, I don't want you to miss any more music. Music is really fun. Maybe they are playing instruments." Behind D, J nods enthusiastically. I take D by the hand. "Let's go back to music." "But I am supposed to meet F," she says. I tell her I will go find F, but that I don't want her to miss any more music. By now J is doubled over, laughing so hard that tears are running down her face. And her teammate has joined her. I shove D in the door to the music class. "She was waiting for F," I say. The music teacher looks confused, but I quickly shut the door and head down the stairs. J stops me. "How do you do that?" she says. "What was she talking about?" I wish I knew. I shrug. And then F appears on the landing. She has another little boy, T, with her. "Hi, Dr. Carol!" she says. "I had to take T to the office. He bumped his head on the recycle bin. So I took him to the office." I smile and comment how nice she is to help her friend. I refuse to ask about the paper towels in the boys' bathroom. I am not going there again. I can hear the sixth grade teachers laughing all the way from the first floor. When he was a little guy, he loved uniforms. He couldn't wait to get his first football jersey. He slept in the shoulder pads and helmet for three nights straight. He loved the kelly green basketball shirt. Didn't take his high school letter jacket off for four months. Even so, I am a little surprised at his reaction to the new work uniforms. He usually doesn't want to talk about work. Or actually much of anything else. when I walk in the door from work. I wonder what might be wrong. How was work? I say, steeling myself for the bad news. and comes out with an armload of clothes on hangers. Six pairs of black pants. Creased. Certified technician over the left. As far as I know, he hasn't been certified in anything. he would get uniforms in 30 days. And he worked there way longer than that. But still didn't get a uniform. He tells me that most people leave their uniforms at work. (I think the car dealership probably has a uniform service). I imagine the grease and grime from a car place. The hours it will take to iron those creases. And suggest he might want to take the uniforms back. And let them do the washing and ironing. and leave three at home. Just to make sure he always has one available. He is so proud of the uniforms. I wish I lived on the East Coast this week? They are supposed to have a blizzard. and I'm a little jealous of my East Coast friends. We haven't had one snow day this year. It will be long and dry. And I worry about climate change. But, selfishly I am also just longing for a snow day. to a whirling winter wonderland. And don't have to go anywhere. I am longing for a snow day. Yesterday, I wrote about Son #1. He is struggling. A lot. Son #2 is struggling too. Since he graduated from high school in 2013, he has started semesters at two different colleges. But not finished. And he a trade school for motorcycle mechanics. He made it to November of a year long course. Most recently, he was employed at a high end sandwich shop. He was fired, I think, when he asked the manager how he felt about people carrying concealed weapons (with permits, of course). The question was purely rhetorical- my son doesn't have a concealed weapons permit, nor does he carry a weapon (at least that I'm aware of), but very soon after that, he was let go. And I suspect there is probably a connection. For about the last month, Son #2 has been sitting around the house, concocting elaborate get rich quick scenes. And I just keep saying, "No, I don't think that will work for me." He is more than a little irritated that I don't like any of his ideas. Here are a few that he has come up with most recently. I just keep saying no. And he is convinced that I am out to ruin his life. Gunsmith- He can do this. But we live in a city where there are no bears or things to hunt. And guns violate pretty much every belief in every fiber of my being. So he could do that. But he would have to pay for it himself. And he cannot bring a gun into my house. Professional sharpshooter- Again possibly. At some point in the future. But until he can support himself doing this, he will need to find some form of alternative employment. Restaurant/Food Truck Owner- My son has extensive food service experience- six months at a doughnut shop, several other shorter gigs at various other restaurants. He is sure he has enough experience to open a restaurant or food truck. I just need to find the place, and help with the startup costs. Marijuana Seller- We live in Colorado. It's legal to smoke. To work in one of those stores, you need to have a license of some kind (I don't know that much about it, because I have never personally visited one of those stores, nor do I have any interest in so doing). My son thinks it would be a great idea if I financed a license for him and his brother. Better yet, we could open our own store. Again financed by yours truly. Walk-on athlete- Both of my sons were very talented athletes in high school. Son #2 was the varsity quarterback when he was a freshman in high school and also played competitive basketball from second grade through high school. He is considering walking on to a sports team, but is not sure whether it would be football or basketball. Which might still be a possibility. However, to the best of my knowledge, he has not picked up a ball of any kind since 2013. He is not working out- running or lifting. And that might be a problem. I also seem to be saying no to many other possibilities. I should sell the car(s) and buy motorcycle(s). I should pay for my sons to travel back to the country of their birth (they were actually both born in Denver, at Denver General Hospital), but they are talking about somewhere in Africa. I should buy a house (and make the monthly payments) so my sons can move out of my house (umm, this one I might consider, if I had the money!). I have suggested several things I consider possibilities- jobs at the airport, in hotels, restaurants, banks, Coca Cola, the post office. I send pictures of help wanted signs every time I see one that looks remotely interesting. He's talked about military service, and even though that scares me to death, I have mostly just tried to listen. I've said that my son might consider going back to school, but that he would have to pay for each semester, and then if he has a B average, I would be willing to pay back at least half of it (except for gun school). None of those are acceptable to him. So mostly, I spend my life saying no, again, and again, and again, and then just in case someone didn't hear it the first time, I say it a little louder. Because everyone knows I am a person who likes to say no. And that I really want to ruin his life. So I am pretty much feeling like a complete and total failure in the growing productive adults chapter of the motherhood. I am at the library, where I am trying to work on grading papers, which were supposed to have been done on Thursday, and which are nowhere close to being finished. My phone rings. It is Son #1. He started a new job this week and is supposed to be at work today. He doesn't usually call me. I wonder what is wrong. "I have a warranty on my glasses, right?" I tell him that he does, but I think it expired in February. And I remind him that when we replaced his glasses last year, they told him that he would need an eye exam the next time. "Don't you have a backup pair of glasses?" I ask. He tells me those are broken too. "How badly are your glasses broken? Do they just need a new sidepiece, or are they too broken to repair?" Both pair, according to him, are broken beyond repair. "I want contacts. Can you help me?" I sigh. I am really struggling with what parenting is supposed to look like at this age. My son is 23. Has a serious diagnosed mental health issue. Has been hospitalized twice, for extended time periods, for this issue, in the last year. He struggles to hold a job. Started a new job this week. Got his first paycheck. And I am wondering, how much am I supposed to do for him? And how much is he supposed to do for himself? He was having brake issues earlier this week. I shelled out $250 for car repairs. I have made his car payment the last three times and also paid his insurance. He is on my phone plan. I have already told him that he needs to plan on making his own car payment and his own insurance payment on April 1st. And now he is asking me to buy glasses. After a lengthy discussion, I told him he needed to stop spending his money however he wants, e.g. on beer and marijuana (I live in Colorado) and video games, and start paying his own expenses. He needs to buy his own glasses. And now I'm feeling really guilty. I don't know that he will go get glasses himself and he really needs them. He has to drive for his job. What if he has a car accident because he can't see? And if he has an accident at work, he will probably lose his job. And if he has an accident with his car, I will be responsible for it, and we will probably lose our insurance, because he has had several other accidents. This is when I wish I was married. Had someone else to do tag team. Because I am pretty much feeling like a complete and total mother failure right now. I know a lot of people don't like lunch duty. They don't like going outside when it's really cold or really hot. They don't like the noise in the lunch room. They don't like the messiness. I love connecting with kids. Take yesterday. The minute I stepped outside a substitute approached me. "Do you see that kid over there? The one in the white t-shirt? He has a big stick. I'm afraid it's not going to end well." I look where she is pointing. I don't see anyone with a big stick. Still, I head across the playground, just in case. It turns out J is hiding behind the recycle bins. And he does have a big stick. Well, not a stick exactly. It's actually a heavy paper tube, about two feet long, that one of the second graders made into a rainstick during a recent unit on sound. Evidently, he has taken it out of the recycle bins. "Hey, J, what is that? What are you doing?" "Hi, Miss. Nothing. I'm not doing nothing?" I wince a little at the grammar, a week before PARCC, but proceed with my stick mission. "What's with the stick, buddy?" "Nothing, miss, I just found this." "Some people are a little worried. That doesn't look that safe." "I won't hit anyone, Miss. I'll be careful." I have known J since fourth grade. He is a sweet, sweet guy and I seriously doubt that he would hit anyone, at least not on purpose, or at least not with the intent of hurting them. Even so, I know that sometimes middle school horseplay can get a little crazy. "Let me hold the stick until after school, buddy. If you want it back, you can come get it from me then." I suspect it's probably out of sight, out of mind, and by the time that 3:00 rolls around, he won't want it anymore. And after a little more discussion, he hands it over, albeit a little reluctantly. And for the next 30 minutes, I march around with a two-foot long tube. At least ten kids, mostly boys, ask me about the stick. Ask me if they can have it. Try to wrestle it from my hand. At one point, I tell two of our resident love birds that it's a PDA measurer I have made, to make sure that there is enough distance between them. I have a lot of fun with that stick. But then there are the more serious moments, the times I am really glad I am out there. B, who has been at our school since late last spring, unfolds his fist to show me a sparkly purple plastic top. "Look, Miss," he says, flipping it out of his hand to show me how it spins. "Cool. Where did you get that?" I ask. "My mom sent it to me. From Mexico." "Your mom is in Mexico?" "Yeah, she's there with my dad. She lives there." I flip through all that I know about this kid. Big kid. Man-sized already. Arrived last Spring. Monolingual Spanish at that time. English developing nicely. Really smart. Beyond polite. Always has a crowd of girls following him around the playground. Registered to attend a technology high school next year. No siblings at our school. "Who do you live with?" I say. "In Centennial. My sister cleans houses. My brother manages a restaurant." My heart clutches, as I imagine this kid, thousands of miles from home, living with older siblings that probably work a lot of hours, sitting by himself in a quiet apartment after school. "How did you end up here?" I ask. "For my school. It's better here." "I'll bet you miss home. And I bet your mom misses you." "Yeah," he says, and drifts away to show three girls his top. I really love lunch duty. For me, it's holy ground. So yesterday, this showed up on the TWO WRITING TEACHERS daily slice post. And if I'm really being honest, ok, I am really being honest, I hate these. Can I tell you why? I am a morning person. I always have been. I got that gene from my father, who always got up super early and read, or worked on yellow legal pads he brought home from the office, or unloaded the dishwasher (which the non-morning people in the house totally loved!). When I was a little girl, I got up with him. We had breakfast together. He helped me with my multiplication tables and algebra homework. I practiced the piano (which the non-morning people in the house totally loved!). As a morning person, I am also a morning writer. Or at least I prefer to be a morning writer. I know I write better in the morning. I am more creative. My thoughts are clearer. The writing is more crafted. I can edit my own mistakes. And when you write in the morning, you get more feedback from other writers. I really like getting feedback. And yet, pretty much each of the last ten days, I have been one of the last twenty people to submit my slice. On Friday, I totally missed the deadline. I sliced, but it was after midnight, at least according to East Coast standards. I hate slicing at night. The writing usually is not as well-crafted. I often read it the next morning and feel less than satisfied. There are usually editing errors I didn't catch. And you get very little feedback from other writers. But right now life is really complicated. My principal retired unexpectedly, mid year, and my professional life is in major upheaval. We are a week from taking the PARCC and I'm frantically reading student work and helping teachers plan those last few lessons. Thinking about how we can help those "cusp" kids score in the proficient range. And help our ELL kids and struggling readers and writers demonstrate all that they can do. And then there's the home stuff. Single parenting of two almost adults, who are not quite acting like adults. Paying bills. Walking the dog. Cleaning. Or at least picking up a little. By the time I get to slicing, it's usually about 9:00. And not 9:00 where I am slicing for the next day. I'm not that far ahead. It's 9:00 where I only have an hour and then it won't even be considered a slice for that day. But I really do want to participate in the Slice of Life community. And so I slice at night. And slap my slices up there at the last minute, knowing they are not the very best I can do. And knowing I won't get many, if any comments. 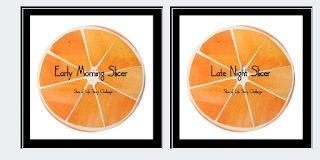 But when I see that "Late Night Slicer" badge, I feel a little sad. Disorganized. Late to the party. Unworthy. 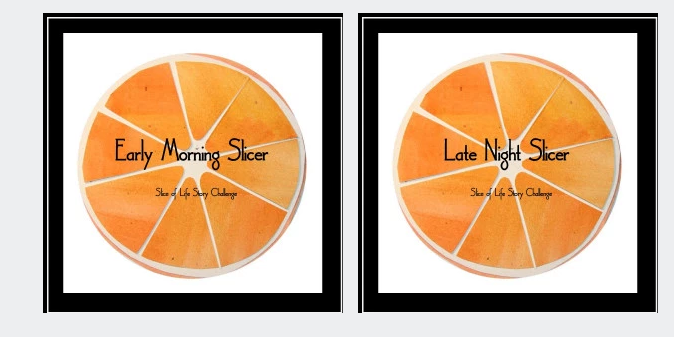 I won't be putting that late night slicer deal on my blog. I don't want to wear that badge. So we are three school days, only three, from the beginning of "the blessed event." I woke up with a headache this morning. I hardly ever do that. But I hate this time of year. Usually I am really good at seeing the strengths in kids' writings. I delight in kids' approximations. But there are only three days until the test. And the writing seems so rough. I start my day in fourth grade. Our nine year olds are finishing an essay. They have read two articles- one about Owen and Mzee, and one about a man who is a quadriplegic and has a service monkey. They also watched a video about two interdependent species. They loved the articles. In conclusion, both of these animal relationships are different in many ways. They both were very interesting. I hope I could see these animal relationships in action some day so I could write a way, way better contrasting essay about these two relationships. I can't decide whether I should laugh or cry. There are only three days until the test. Next I go to third grade. They have worked so hard on their writing. Have improved so much this year. But they have to type their essays. Some of the kids do fine. But some are really, really slow. Their lines poke along the page, and I despair of them ever having a paragraph on paper, let alone a full story or five paragraph essay. They have recently learned to use dialogue. And they are really proud of it. They are not that good, though, at punctuating their dialogue. There are misplaced commas and quotation marks all over the place. Usually I would be able to celebrate and honor their approximations. But today I just wince. There are only three days until the test. I have an intervention group in this class. One of my little guys has been gone for several days after tossing his cookies in the middle of the classroom. Reading has not come easy for him. And we have worked hard. He is back today and greets me as I walk in the door. Wants to tell me about the story he is writing. A continuation of a story that they had just finished reading. T. tells a beautiful story, complete with details. But then he has to type. His first few sentences are about the family waking up, and having breakfast around the campfire. He wants to write that they had pancakes and sausage, but he cannot figure out how to spell sausage. He finally settles on pancakes and eggs. "I really like sausage," he says, "but I know how to spell eggs." Usually I would just tell him to spell the best he could, but not today. There are only three days until the test. After lunch, I go up to fifth grade. I have another intervention group that comes out of this class. One of my little gals, M., is sitting in the front of the room, away from the class. She tells me that this is her office, that she wants to work alone where it's quiet. She proudly shows me how carefully she has annotated the prompt, circling words like journal and point of view. "And look, look what I did," she says, waving a piece of paper in front of me. She has written a whole page. She reads it aloud to me, and I can hear the pride in her voice. I read the prompt, and ask her to show me the different parts in her writing. "I did it," she says, "I did it." She points proudly to where she has covered each part of the prompt. She really did do it. I just wish she had used paragraphs, and perhaps a few periods in the first half of the text. There are only three days until the test. Finally, I touch base with Y. She is the oldest of four girls, has a hard, hard home life. There is little joy. But this year, she has joined the literacy club, devouring graphic novels, one after another. And she's written, a lot. She's been so proud of the growth she has made in writing. The last few weeks I have seen a difference in her. All of the recent joy and pride are gone. "I'm not one of the smart kids, miss," she says. She leans back and draws designs on her hand with a brown sharpie. And I wonder how I can build her up again. There are only three days until the test. About a week from the blessed event. We are in that final push, writing and writing and writing. Remembering all that we have taught. Worrying over what we haven't. This morning I am in fourth grade. We are doing a research simulation. The kids have read 2 articles and watched a video, we have annotated the prompt, planned together, and now they are ready to write a piece comparing two of the articles. Robin, the fourth grade teacher, and I circle the room, conferring with individual kids. D's voice breaks into my writing conference. I am surprised that she is interrupting my conference. I have just finished speaking to her, and she seemed really clear on where she wants to go with her essay. And the kids know better than to interrupt a writing conference. Almost before I can respond, she says, "Dr. Carol, I need help." Again, I am surprised. She is usually not that needy. I think she is talking about her writing. "You are stuck?" I ask, all ready to ask her what writers do when they get stuck. Suddenly, her table partner feels the need to intervene. "Dr Carol, her foot is stuck." "Her foot is stuck?" I say dumbly. D's face is now one of complete panic. I bend down to look at her shoe. Somehow, she has managed to jam her sparkling white, brand new tennis shoe into the metal book rack soldered to the bottom of the chair. And now she is stuck. I try to wiggle her foot a little. "Ow," she says. "That hurts. My foot is stuck." I can't figure out what to do. Her foot really is stuck. I decide to take her shoe off, but it is double knotted, so I sit down on the floor next to the chair and pick at the knot. An audience is beginning to gather. I pick at the knot some more, and finally manage to loosen it. I still can't get her shoe off. "You need to loosen the laces," advises R, who sits right behind D.
I pull the laces. The shoes appear to be new and the lacing holes are tight. I tug at them for a couple of more minutes. "You have to undo them all the way down," R says. Finally, I manage to loosen the laces enough to get the shoe off. D's foot releases. "Phew," I say. "I guess you don't have to take our chair home with you." D is embarrassed, but manages a half-hearted smile. She returns to her writing and I return to my conference. Just another day in the life of a writing teacher, a week before the tests. OK, I actually don't know how many this year. has been more than a little bumpy. But today he started again. Detailing at a car dealership. A job he found on the internet. I send up a prayer. That the job will be a good fit. That he will like it. That he will be surrounded by good people. That there will be room to grow. At noon, I text again. I did not expect that he would. but also did other things. That they ordered him a uniform. And I pray that this job will last.